Vinilisssimo presents a first vinyl reissue of Luiz Melodia’s Maravilhas Contemporâneas, originally released in 1976. Often overlooked, Maravilhas Contemporâneas is one of the greatest Brazilian albums of all time and one of the finest recordings released on Som Livre. To listen to Luiz Melodia singing is to understand that his music escapes any attempt at labeling. Obviously, the Brazilian music tradition is very present on this record but Melodia’s rhythmic sense when using his vocal skills also brings it close to funk or jazz, an idea that is reinforced through the explosive brass arrangements that pervade the whole album. 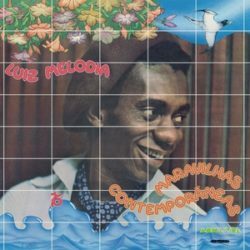 Melodia’s first album, Pérola Negra (1973) had featured the outstanding arrangements of Arthur Verocai and the performance of top musicians Hyldon and Meirelles, but Maravilhas Contemporâneas stands as another essential milestone in his career and further proof of his formidable talent. One of the tracks included here, “Juventude Trasviada”, was featured in the soundtrack of a popular Brazilian soap opera, Pecado Capital, boosting the artist’s increasing popularity. The creative freedom and the wide range of influences managed by Melodia reach their peak in “Baby Rose”, a song that evolves from cosmic psychedelia, including the sounds of the sitar, to the peaceful beauty of some kind of highly tuneful samba funk. “Questão De Posse” features fierce proggy guitars while “Veleiro Azul” adds Latin rhythms into this unique recipe, but again, it is the talented voice of Melodia what grants this recording a pass to another league. Maravilhas Contemporâneas deserves to be filed next to the finest albums by Caetano Veloso, Jorge Ben, or Gilberto Gil. This superb album combines the best of Brazil’s musical tradition with jazz, funk and gentle psychedelia and is fronted by Melodia’s outstanding vocal skills. Presented in facsimile artwork and pressed on 180 gram vinyl.